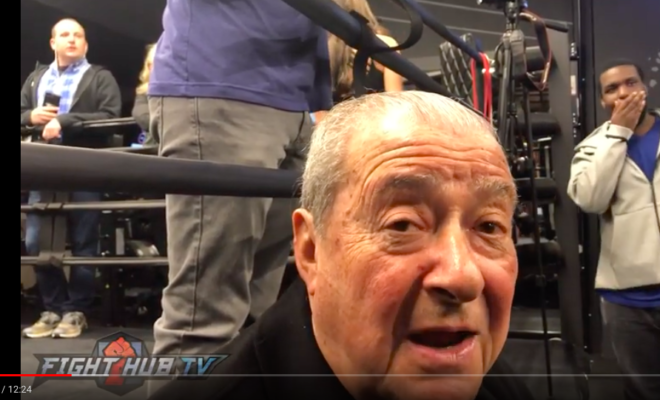 Top Rank chief Bob Arum took questions during a Tuesday media workout, and the Las Vegas resident, born in Brooklyn, spoke on the Saturday night main event at MSG, the big room. He touched on the meaningfullness of having ace fighters main event at the big room, and spoke on his other A side aces, like Vasiliy Lomachenko. The promoter said that he still gets very jazzed at having Top Rank look to fill up the world’s most famous arena. He said the young gun boxers, many of them, are respectful of history. Oscar De la Hoya, the other special talents, they all ask Bob to book them at MSG. “There’s a special feeling,” he said, when they come to NYC and enter THAT ring. 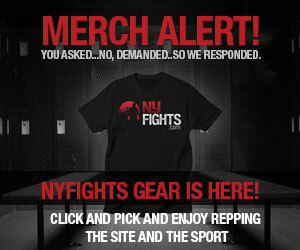 Maybe Bud Crawford really elevates his game because he will be doing it in MSG. Not partially, that will fully be so, said Arum, touching on the Bud scrap versus Amir Khan. Arum said he’s loved how hard Khan works to promote and apparently work in camp. He promised a competitive scrap, which some assume won’t occur, because they think Khan’s chin will give out on him. More about the other ace; Loma said that his right shoulder was fully healed against Anthony Crolla, which was not so against Jose Pedraza, Arum shared. “This time the doctor said OK, one hundred percent, good to go, throw the hook,” and you saw the effect. Loma told him “I wasn’t the same the last two fights because of the shoulder,” the deal-maker continued. He also said that yes, Loma was injured a bit versus Crolla at Staples Center. On Saturday, Loma had a ligament put back in place. He will be in a cast for six weeks, Arum said, and then the cast can come off the right hand, and after eight weeks, he’s fully good to go. So, a September date is looking likely. 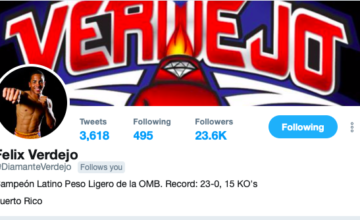 Richard Commey, perhaps…Mikey Garcia, maybe, or perhaps Luke Campbell. 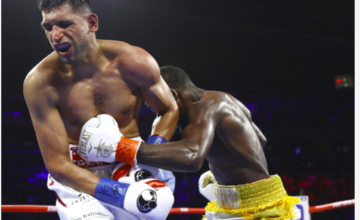 No, Arum hasn’t put in a call to Mikey or Team Mikey, he shared, but he is waiting to see what Garcia decides to do with his weight class, and with the WBC, who is awaiting word on Garcia’s move. We also touched on the Brooklyn-born Teofimo Lopez. Arum said that he doesn’t want to get carried away on Lopez. “He’s still wet behind the ears,” he stated, declaring that Edis Tatli is a true test. “He is capable of giving Teofimo a big fight, particularly if he goes to the later rounds,” the living legend said. More good stuff from Arum; he told us what the difference is between now and a couple years ago, when he mostly put his fare on HBO. Now, he’s on ESPN, and ESPN lets Top Rank steer the ship. Arum also teased that he thinks that this PPV will do a really good number, because he thinks that ESPN’s ability to promote the card will pay immense dividends. 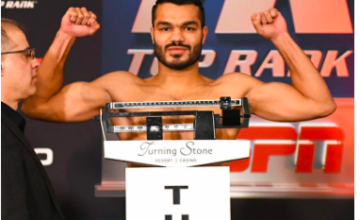 He said also that the game has changed because UFC moved their fare to ESPN+, and now the cablers are worried that Top Rank would do the same…Thus, he seemed very upbeat about the possibility that the buy rate will be higher than he’d assumed earlier on. Check out the whole interview right here.